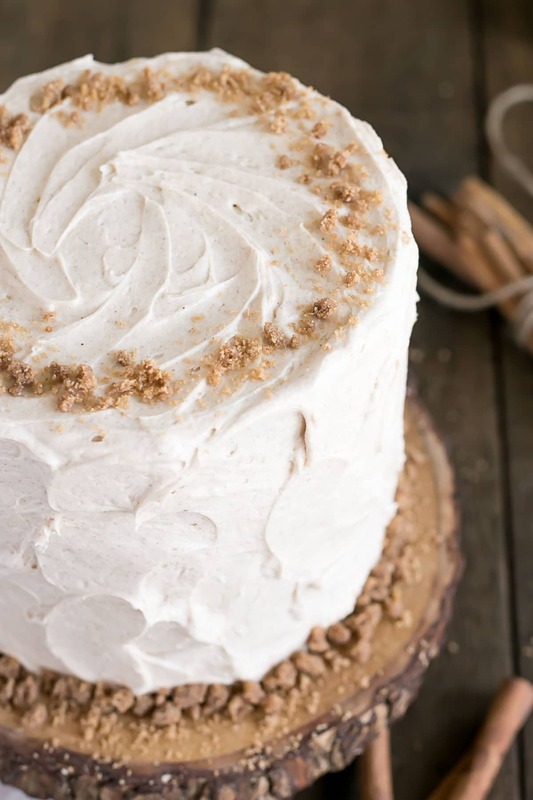 This spice cake is the ultimate comfort food. Paired with cinnamon cream cheese frosting, and cinnamon streusel for some crunch. Aside from myself, Ryan is the only person I bake a birthday cake for every year. Friends and family will certainly get slices of a cake I happen to make around their birthday (though I do take their flavour preferences into consideration), but Ryan is the only one who can actually request a specific cake for his birthday, and I will happily make it. I actually bug him for flavour ideas repeatedly leading up to the day. Last year, he requested a Cinnamon Toast Crunch Cake because it’s one of his favourite cereals. You really can’t go wrong there, amiright? This year, his request was for a Spice Cake with cinnamon frosting. I guess he has a thing for cinnamon! 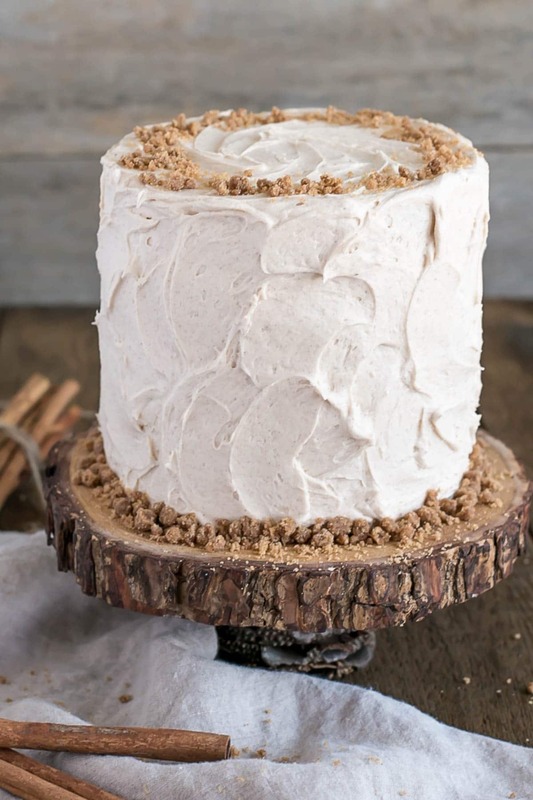 Though arguably more of a Fall flavour, I feel like spice cake can (and should) be eaten all year round. There is something so comforting about the smell of all those delicious spices. It’s the perfect warm hug on a cool spring day. This Spice Cake is fairly dense and fudgy (if you can call a non-chocolate cake fudgy) due to the applesauce in the cake batter (vs something like buttermilk). The applesauce adds both moisture and flavour, and is the perfect addition to this cake. Apples and spices go hand in hand in my opinion. I am really loving cream cheese frostings lately. I don’t like cream cheese on its own, or even cream cheese based cheesecakes, but there is something about it in frostings that has me all like <3 <3 <3. I think it’s the combo of sweet/tart without being overpoweringly cheesy. The cake isn’t overly sweet either, and I think it’s just the perfect balance. My cream cheese frosting has more butter in it than most, to help balance out the cream cheese and create more of a workable texture. 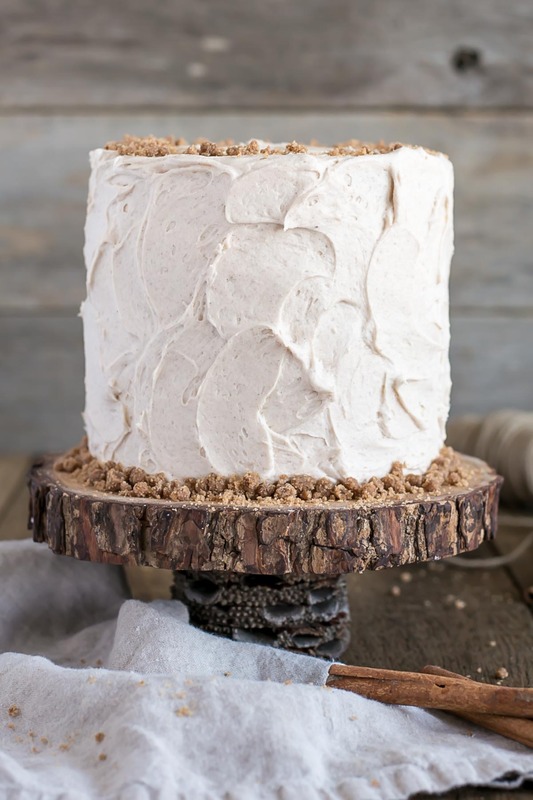 Cream cheese frostings can be soft and difficult to work with, but this one is perfectly light and fluffy, and goes particularly well with this spice cake. 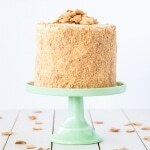 I added some cinnamon streusel for some crunch, because I love the additional texture and flavour it gives to a cake. 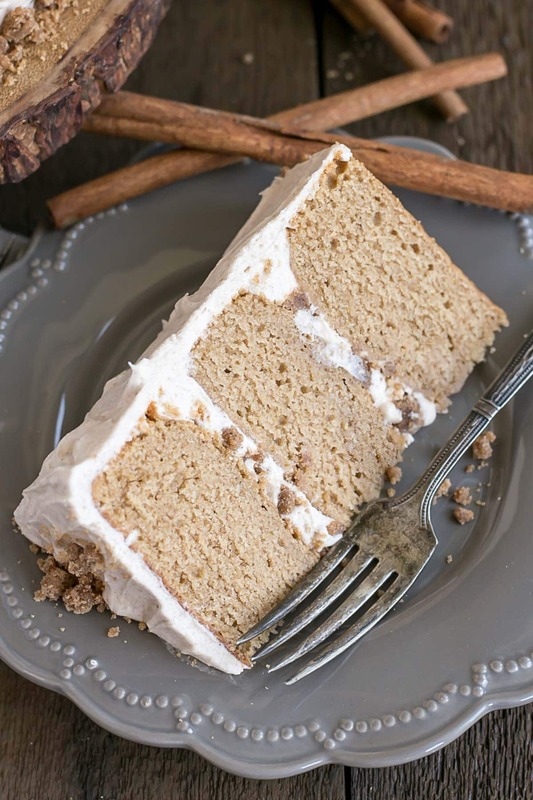 You can skip this if you’d like, but it’s so easy to make and really adds more dimension to this Spice Cake. I promise you this cake is SO good. Coming from someone who isn’t exactly a cinnamon lover, I think this speaks volumes. You will not be disappointed! If you don’t have applesauce, you can substitute buttermilk or regular milk. The cinnamon streusel is optional, but easy. It’s really delicious! 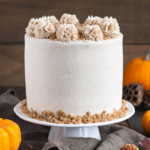 If you like this recipe be sure to check out my Apple Pie Cake, Cinnamon Toast Crunch Cake, and Pumpkin Spice Latte Cake! Using a stand mixer fitted with a paddle attachment, cream butter and dark brown sugar on med-high until pale and fluffy (approx 3mins). Alternate adding flour mixture and applesauce, beginning and ending with flour (3 additions of flour and 2 of applesauce). Fully incorporating after each addition. Combine all ingredients in a medium bowl until clumps form. Spread on parchment lined baking sheet and bake for 5-7mins. Cool completely on baking sheet. Break up any larger chunks if needed. Beat butter and cream cheese until fluffy (2 mins). Add powdered sugar one cup at a time. Add vanilla & cinnamon and beat until fluffy (3 mins). Place one layer of cake on a cake stand or serving plate. Top with 2/3 cup of frosting and 1/4 cup streusel (or more if desired). Repeat with remaining layers and apply a thin coat of frosting all over the cake. Chill for 20mins. 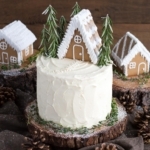 Use the remaining frosting to frost the cake with rustic swoops. Use extra streusel to decorate bottom and top of cake if desired. Love the idea of putting applesauce in this! Do you think you could swap all-purpose flour for pastry flour when making this cake? Thank you! Hi Molly! I haven’t tried it myself, but I think it would work fine. 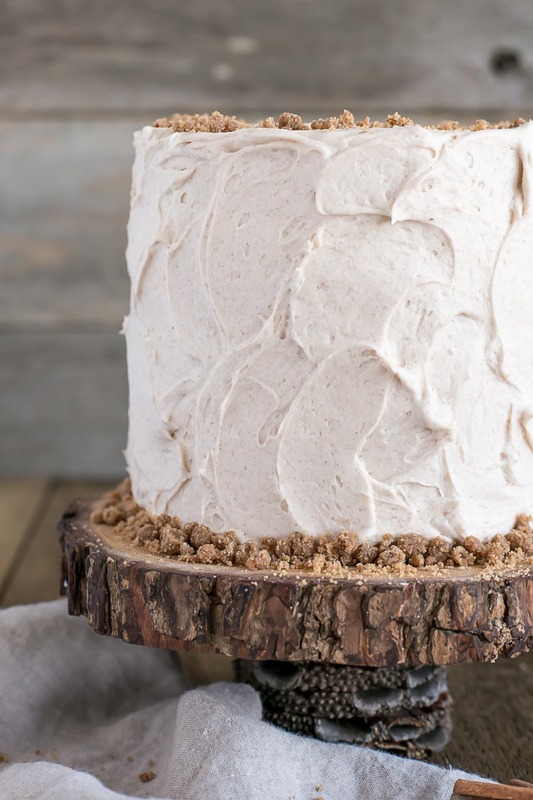 How can I make the frosting just cinnamon buttercream? How much extra of the ingredients would you recommend I add? Hi Tony! I would use 2 1/2 cups butter and leave the cream cheese out. You might want to add another cup of powdered sugar as well, but just taste the frosting and see if you’d like it sweeter. Hi. My husband asked for spice cake for his birthday so, naturally, my goal is to succeed with your beautiful recipe. Unfortunately I do not own three 6” pans. Would I need to adjust the recipe and cook time for two 9” rounds? What would you reccommenf for bake time? Thanks so much for posting all of these stunning cakes. I’m new to your blog but I’ll be working my way through lots of your recipes. Hi Debra! Converting pan sizes is always tricky. 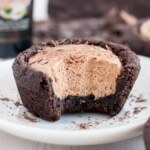 Here’s a site I use as a guideline: http://www.joyofbaking.com/PanSizes.html I would try 1.5x the recipe for two 9″ pans. Let me know how it turns out! While I was making this cake, it seemed extremely thick and it was a struggle putting it in the pan. I think the flour was too much for this cake and it made it super dense. My cake did not rise at all and it seemed dry when I took it out of the pan. I decided to make a buttercream frosting instead of the cream cheese one and it did not stick on the cake at all. The frosting was not spreading and I couldn’t cover the cake at all. I don’t know if I did something wrong but I was pretty disappointed with this recipe because it was also too dense and thick to eat. I have made many of your cakes before and they all turned out great except for this one. Hi Afreen It sounds like something was off in the measurements. The batter is thick, but easily spreadable. How do you measure your flour? It’s best to spoon and level rather than scoop as it can account for a significant difference. Just made this for my mom’s birthday cake. I only had 2 6″ x 3″ pans, so I split the batter between them thinking I could cut them into four layers. Well… the resulting layers are kinda little. They’re 6″ around, but only 1.5″ high. Could this be the leavener? I used the baking powder and applesauce combo recommended. In the meantime, wondering how to fix this so she doesn’t think I’m trying to stiff her on her birthday cake. 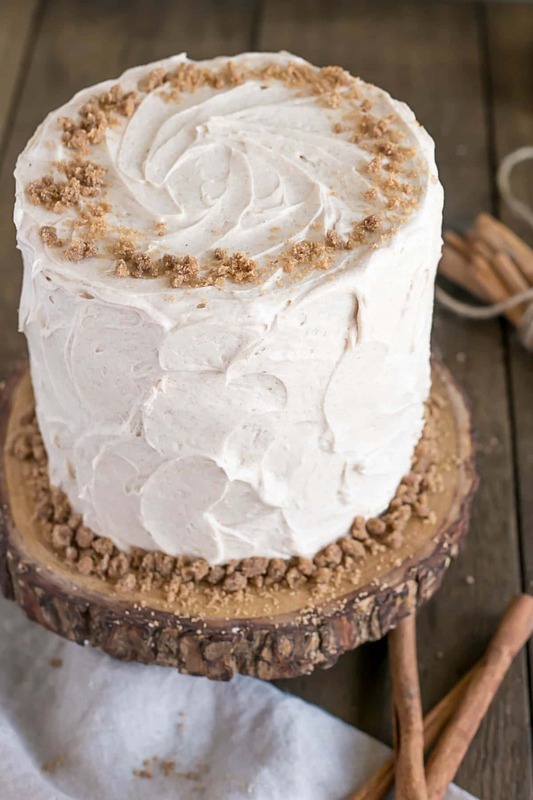 Bake another recipe or cut them in half and try to pick up some height on the frosting/streusel combo? Hi Courtney! They should have been taller since you only baked in two pans. My layers were 1.5 to 2″ tall. Is your baking powder fresh? Are the cakes super dense? I made this yesterday for my wife’s birthday and I’ll be daydreaming all day about getting home and having another slice. I’d never made a layer cake before and it all worked beautifully. The cake baked up in nice dense fudgey flat layers and it was so easy to assemble and frost. Some changes I made: I don’t have 6″ pans so I made two layers of 9″. I added more of all the spices since my wife likes it heavily spiced. Also after reading the comments about the streusel I made a 1 1/2 sized batch to have enough for “testing” it which I obviously had to do several times. 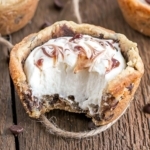 That left plenty to generously fill between layers, coating the top, and decorating around the rim, as well as nibbling the extra. Because one of the guests was lactose intolerant, I substituted a cinnamon buttercream for the cream cheese frosting, and it worked with it just fine. It was essentially the same recipe with more butter in place of the cream cheese and a little lactose-free milk to thin it. Definitely saving this to make again. Hi Stacey! Thanks for the great feedback, I’m so happy you both liked it!! Looks and sounds terrific! Can it be done in a 9X13 pan? Can’t wait to try it! Hi Barbara! Yes, you may need to adjust the baking time though! Olivia, I made this cake for a dinner party last week and can honestly say it was the most beautiful and most delicious cake I’ve ever served! I used 3 6″ x 2″ pans and wrapped them with the soaked cake strips. They did turn out flat, but didn’t rise to the top of the pans as I expected – the layers were only about 1-1/2″ thick. Did I do something wrong? It was honestly “fudgy” as you say, so maybe that is normal. Regardless, it looked beautiful and the taste was out of this world! Would using sweetened apple sauce make much of a difference? They don’t sell unweetened where im from. Thanks! Thank you so much!! I can’t wait to try it. Btw, I made your milk and cookies cake for my son’s last birthday and it has been requested three more times since. We love it!! I have high hopes this will be just as big a hit. Thank you!! Looks delish!! My son is requesting a chocolate cake with apple filling for his birthday. Do you think I could turn this into a chocolate spiced cake with apple filling and the cream cheese frosting between layers? 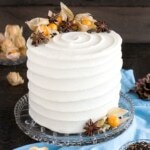 If so, would I alternate the frosting then apples or apples then frosting between each layer? This was a pretty solid recipe. I didn’t find it very spiced, so I added more ginger and a teaspoon of allspice. That helped, but I probably could have added more to be honest. I liked this recipe and was satisfied to serve it at a party, but I will probably try another recipe next time I’m looking to make this sort of cake. Unrelated, but please don’t be one of those people who rates a recipe “5 stars” because it looks good. It’s incredibly misleading. PSA over. My husband loves Spice Cake. I’ve never been a fan of the flavor of cloves. I will say, this recipe sounds amazing. So…. this is what I’ll be baking to bring to the in-laws for Thanksgiving this year. Thanks for the great recipe! Yay! Happy to hear that. I hope everyone likes it 🙂 Let me know how it goes! Can you convert this into cupcakes instead ? Just adjust the timing ? Hi Sabrina! Yep, check them at 15mins or so to see how they’re coming along. Hi there! Could this be made in a large bundt pan? Thanks! Hi Tammy! I’ve never tried it myself, but I don’t see why not. You’d need to adjust the baking time though. I Did 40min at 350. Came out so moist! I followed the directions but my cakes don’t seem to be as thick as yours are. Not sure what I might have done wrong? Hi Natasha! How much thinner did they seem to be? Did you use the same pan size? I’m making this now and it all smells amazing. Thank you for this recipe! 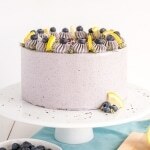 This is such a gorgeous cake! 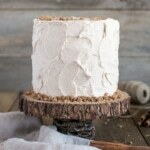 I am loving the log cake stand. It sounds delicious! This one sounds delicious, thank you for sharing yet another great cake with a fabulous icing. Will definitely make the crunch topping too. When I make this, could I just use two 8 inch cake pans? 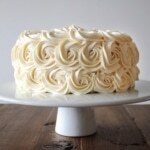 I just might have to buy some smaller cake pans in the near future because I love the idea of three layers.